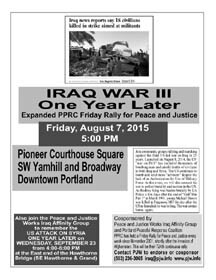 On Friday, August 7, community groups will rally and march against the third US-led war on Iraq in 25 years at an event titled "IRAQ WAR III One Year Later." The event will take place at Pioneer Courthouse Square at SW Yamhill and Broadway. Launched on August 8, 2014, the US' "war on ISIS" has included thousands of bombing runs and untold deaths of civilians in both Iraq and Syria. The US continues to bomb and send more "advisors" despite the lack of an Authorization for Use of Military Force. At this event, we will also connect the war to police brutality and racism in the US. As Rodney King was beaten brutally by LA Police a few days after the end of "Gulf War Part 1" in March 1991, young Michael Brown was killed in Ferguson, MO the day after the US re-launched its war in Iraq. The war comes home, again. The need to raise peaceful voices in opposition to warfare has intensified as a report was released in early August showing that at least 450 civilians have been killed in the "War on Isis" . Meanwhile it's been revealed that the US is now providing air support to back their funded and trained rebels in Syria, which undoubtedly will eventually lead to a "mission creep" where the war focuses on the Syrian government as well as Isis. The event is cosponsored by Peace and Justice Works Iraq Affinity Group, Portland Peaceful Response Coalition and Jewish Voice for Peace-PDX, and endorsed by Occupy Portland Elder Caucus. PPRC has held a Friday Rally for Peace and Justice every week since November 2001, shortly after the invasion of Afghanistan. This will be their 724th continuous rally. Contact PJW to endorse or cosponsor (503) 236-3065 iraq @ pjw.info.